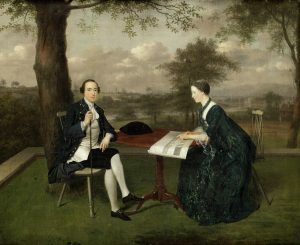 This 1753 painting by Arthur Devis (1712-1787) shows James, Ist Duke of Leinster and his wife Emily seated in the grounds of Carton – a garden said to have become the model on which all later gardens in Ireland were styled. Emily, who played an important role in the development of the house and estate, holds designs for a new bridge. She created the Chinese Room and the shell cottage on the estate, The grounds were re-designed in the naturalistic style of Capability Brown, incorporating an informal park, artificial lake and island, a kitchen garden and hothouses. 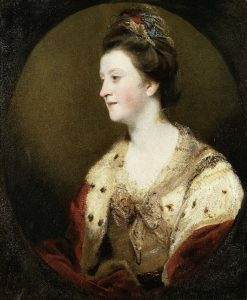 Emily Lennox married James FitzGerald, 20th Earl of Kildare and the future 1st Duke of Leinster at Richmond House, the London residence of her parents. Those parents, the Duke and Duchess of Richmond, opposed the match at first, preferring an English man. The wedding was magnificent but it was rumoured, incorrectly, that her parents had not given her a shilling. In fact she got £10,000, the same as her two younger sisters. The marriage was a happy one and they had 19 children. 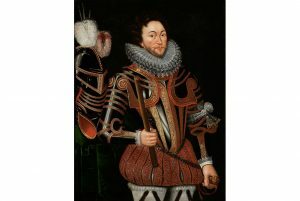 The work, from the collection of the current Duke of Leinster, comes up at Bonhams Old Master Paintings sale in London on July 4 estimated at £80,000-120,000. 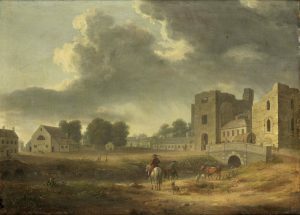 A pair of views of Maynooth Castle, by William Ashford P.R.H.A. 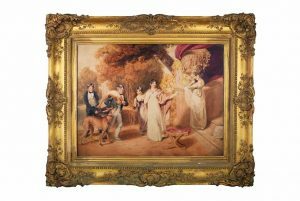 (1746-1824) comes up at Bonhams Old Master Paintings sale in London on July 4. These fresh to market works are from the collection of the Duke and Duchess of Leinster. Painted in the Anglo-Irish Romantic tradition, they were commissioned by William FitzGerald, 2nd Duke of Leinster. Ashford, in a remarkably short space of time, had advanced from being a flower painter to becoming one of the most accomplished and sought-after view painters in Ireland. He was elected as the first President of the Royal Hibernian Academy in 1823, the year before his death. 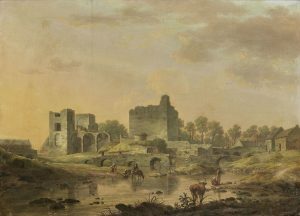 Depicting the ruins of the former FitzGerald family seat, the ‘Views of Maynooth Castle’ are signed ‘W. Ashford’ and dated 1779 and 1780. In the Carton inventory of 1885 they were listed as hanging in the passage by the principle staircase of the residence. 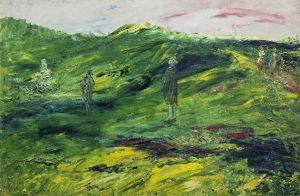 The paintings are estimated at £80,000 – 120,000. An 18th century Irish Provincial silver box comes up at Bonhams Home and Interiors sale in London on March 7. 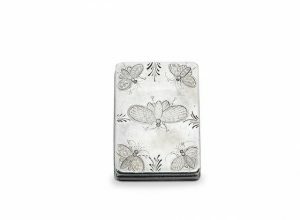 The c1730 box by William Clarke, Cork has a hinged cover chased with rococo decoration with butterflies on the base. It is estimated at £1,000-1,500. On March 21 Bonhams will offer garden notes and a library catalogue for Burton Park, near Churchtown, Mallow, Co. Cork. It will come up as part of a fine books and manuscripts sale and comprises an account of seeds and plants in the garden and runs from April 1683 to February 1683-4. The estimate is £1,000-1,500. 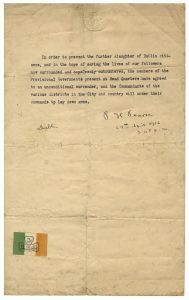 A typed Order of Surrender from the 1916 Rising signed by Patrick Pearse comes up at Bonhams in London on June 14. One of the most significant documents in Irish 20th century history it ended the abortive attempt to overthrow British rule in Ireland and establish an independent Irish State. After six days of bitter fighting Pearse offered the surrender to prevent further bloodshed. Ronan McGreevy editor of Centenary – Ireland Remembers 1916 to be published this autumn explained the significance of the order: “The terse document expresses Pearse’s belief that he would certainly be executed, but that all the others would be spared. Instead the British executed 15 leaders, including Pearse, and imprisoned thousands. This brutal military fiat turned Irish public opinion against British rule in Ireland exactly as the rebels had hoped”. 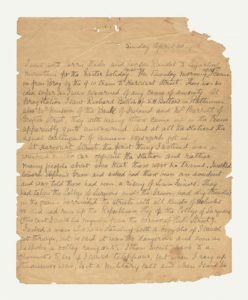 A small number of copies were made, signed by Pearse and distributed to rebel positions in Dublin and the outlying countryside by Nurse Elizabeth O’Farrell, who had acted as go between during the surrender negotiations, and members of the Capuchin community. It is not known exactly how many typed copies were produced, but it is thought to be in single figures. Two surviving copies are held by the National Library of Ireland. Another, signed by Pearse and countersigned by James Connolly, is held at the Imperial War Museum, London. In addition, there are known to be three hand written drafts. It is estimated at £80,000-100,000. 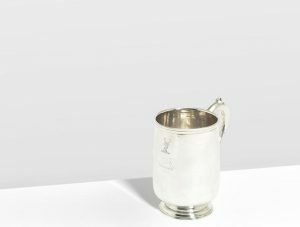 A rare 18th century silver mug by Mark Fallon, Galway c1730 which was on display at the Victoria and Albert Museum from 1974 to 2003 comes up at Bonham’s in London on April 5. One of only three known secular pieces made by Mark Fallon the mug is straight sided with a double scroll handle and engraved with two crests. The Jacobite Galway, which supported the Catholic King James II, was besieged and captured during the Williamite Wars in Ireland from 1688-91. Trade and industry suffered as oppressive laws led to the departure of many families. Because of this Galway silver is rare and most surviving pieces were designed for religious use. The c1730 mug by Mark Fallon is estimated at £12,000-15,000.